The Panasonic DMP-BD65 Blu-ray player is an impressive performer that packs in plenty of functionality for a reasonable asking price. The Panasonic DMP-BD65 is an affordable Blu-ray player with a plethora of built-in features. Highlights include inbuilt Picasa/YouTube/weather/Bloomberg browsing, an SD card slot with SDXC support, 7.1-channel surround sound, an optical digital audio output and advanced 1080p upscaling. The Panasonic DMP-BD65 also comes with a front-mounted USB port for easy media file playback — although codec support is limited. 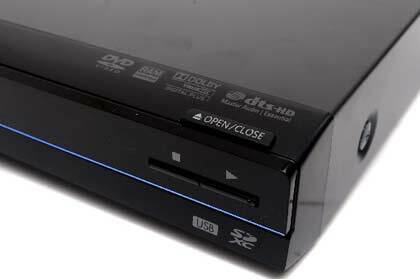 The Panasonic DMP-BD65 is a refresh of last year's Panasonic DMP-BD60 Blu-ray player. Panasonic has added support for SDXC memory cards to its new model, along with access to new online content such as weather and Bloomberg financial news (more sites and services are reportedly on the way). It also benefits from a more slimline design. The Panasonic DMP-BD65 measures 49x430x207mm, which makes it one of the smallest Blu-ray players on the market. While it doesn't quite match the ultra-compact dimensions of the Kogan Blu-ray Player Slim BD 2.0 Full HD 1080p, it should still fit pretty much anywhere you care to put it. In addition to being small, the Panasonic DMP-BD65 is an attractive looking device. A mirrored faceplate covers the tray-loading disc drive, while a flip-out door conceals the SD card slot and USB port. Curiously, the eject button is located on the opposite side of the disc tray, which feels a bit unnatural at first. 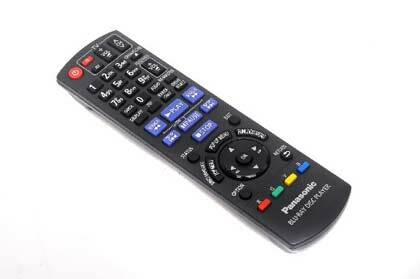 The Panasonic DMP-BD65 comes with all of the expected connectivity options. 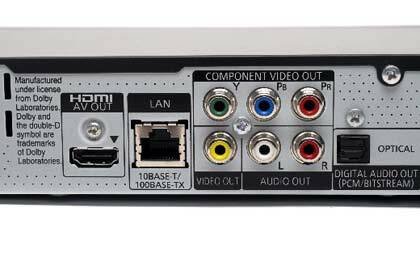 These include composite video, component RBG, coaxial digital audio and HDMI. Only a component video cable is provided in the sales package, however. In addition to an Ethernet port for BD Live downloads and Web access, the Panasonic DMP-BD65 is also Wi-Fi ready. However, you will need to purchase a Wi-Fi adaptor separately to connect to your wireless router. The included remote is a little too complicated for our tastes. Frequently used controls, such as Eject and Main Menu, are hidden in obscure places or beneath unhelpful labels. On the plus side, the remote is reassuringly chunky and remained perfectly responsive throughout testing — we just wish it was a little more user-friendly. The Panasonic DMP-BD65's on-screen menu is basic and straightforward, with a host of handy on-screen explanations to guide novice users. This includes a playback information window, which displays details about the current disc being played (native resolution, frame rate, video codec, etc.) All up, we had very few issues with the DMP-BD65's interface — it gets the job done and looks pretty stylish to boot. As mentioned, the Panasonic DMP-BD65 comes with a USB port and an SD memory card slot in the front. The card slot is able to access photos and AVCHD video, while the USB port handles JPEG and MP3. We would have liked to see more video codec support from the DMP-BD65: the omission of DivX and MKV is particularly frustrating. To test the Panasonic DMP-BD65's playback performance, we hooked it up to a 50in Sharp LC52LE820X LED TV and watched the Blu-ray edition of Terminator: Salvation. From the opening credits onward, the DMP-BD65 produced vibrant, razor-sharp images with plenty of intricate detail; even in the most complex shots. Our regular DVDs also looked solid, with the Panasonic DMR-BD65 doing a great job of upscaling standard-definition video to 1080p. The DMP-BD65 is capable of decoding the latest BD audio formats such as Dolby Digital Plus, Dolby TrueHD and DTS-HD Master Audio. The Panasonic DMP-BD65 required just 18 seconds of prep time before it began playing a disc — a significant improvement over previous models we've tested. Once the disc was playing, skipping chapters produced a slight lag, though nothing we couldn't live with. All in all, there is a lot to like about the Panasonic DMP-BD65. Those who require 7.1-channel audio will be especially well serviced by this excellent Blu-ray player.